SPORTS CLUB INVITATION: An email has been received with the request for a small insert in this column notifying all and sundry of an ‘Open Day’ of a local Tennis Club and extending an invitation to any interested players in coming along, meeting the players and finding out more information. Mountfield Tennis Club began as a sports and social club originally intricately connected to British Gypsum. It has since moved to VineHall School where it has the use of three 1st class courts. It is LTA affiliated and competes in the 1st Division Mixed Wealden Tennis League. The club also has a new coach -Dan Cole- arriving in late April who will be available for additional coaching if required. Naturally the sport of tennis is the driving force of this club, but regular social events for other members of family and friends are arranged throughout the year. These include B.B.Q.’s- Gender Blind Doubles Tournaments as well as a Family & Friends Play Day which includes organised Doubles before lunch, followed by a picnic harmoniously brought and shared and enjoyed by all. After lunch an annual game of rounders is played with great enthusiasm. In the winter months a Christmas Lunch is also a delightful and friendly social date to look forward to. These dates are to ensure that family and friends are not excluded in any way, as we all know how passionate players can become about their chosen sport. The club play tennis all year round and the normal ‘play times’ at Vinehall are on Tuesday evenings by arrangement - Thursday evening from 5.30pm and Sunday mornings from 10.00am. The ‘Open Morning’ is on Sunday April 14th at Vinehall School, from 10.00am. All abilities - adults and/or children will be very warmly welcomed. Please contact Martine on 07967~224328 or check out www.mountfieldtennis.com for more details. STAPLECROSS BOWLS CLUB: ADVANCE NOTICE - To mark the beginning of the club’s new playing season of 2019 and to welcome back their members of this friendly local outdoor bowls club, the club will be holding a ‘Coffee Morning’ on Saturday April 13th at 10.30am at their Club premises on Northiam Road, Staplecross TN32 5QH. This little gathering will also welcome any new members and potential players who may be interested in joining the club. This may be of particular interest to new residents of our expanding parish. Whether you have played before, are experienced or a novice or know absolutely nothing about this sport, this could be the perfect opportunity to take up this social, slow, but skilful sport whilst enjoying being out in the fresh air. If you are unable to attend on this date, - a ‘New Members Evening’ has also been arranged for the same purpose. This will take place on Friday April 26th at 6.00pm also at the club’s own grounds. Either of these dates are open to anyone considering a new sport, where you can talk to any member of just what’s involved and have a free ‘taster session’ to decide for yourself. There is no need to book, - just arrive and join in !. Please wear (or bring) flat, heelless comfy shoes as only this type are allowed on the greens. Contact can be made to the club’s Captain - Terry on 07958~530632 for any further information. All will be made very welcome. ROTHER RAMBLERS: Two more walks for us to consider participating in this week. Walk No:1 is planned for Sunday April 14th and will be a 10 mile circular walk of Stonegate and Mayfield. The meeting point is at Stonegate Railway Station. OS.EXP136. TQ658272. (satnav TN5 7EU) at the slightly later time of 10.30am. The group will wait for any passengers alighting from the Hastings train - arriving at 10.23am who are coming to join them. Please be aware there is also a small car park charge here. There is also the option of a pub or a picnic lunch. 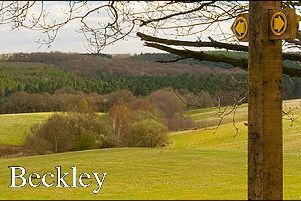 Heather is to be your ‘walk leader’ on this occasion and you may contact her on: Mobile 07968~294038 for more details. Walk No:2 is of slightly less foot fall being only an eight mile circular stroll around Appledore. This walk is arranged for Wednesday April 17th and the meeting place will be at the public car park , off the village High Street. OS.EXP125.. TQ955297. (satnav TN26 2AF) at the normal time of 10.00am. The walk notes state “The terrain is easy and again, with the suggestion of a picnic lunch” Martin is to be your ‘walk leader’ for this excursion and you may contact him on 01424~752793 for all further information. STAPLECROSS SOCIAL CLUB: As we head towards the Easter Week-end Period and the end of April, this great little social club, tucked away in the heart of Staplecross village, have once again, organised two family events for us all to enjoy. The first event will take place on GOOD FRIDAY - April 19th. This is the popular fun ‘Bingo Bonanza’ and starts in the club at 8.00pm. The following day -.Saturday April 20th from 2.00pm until 4.00pm sees the ‘Kid’s Easter Bonnet Party’ unfurl and this event will also include games, prizes, super food and a disco. As always it promises to be a fabulous event with fun for all the family - so don’t miss it !. This super club does so much to ensure our community has a wide and varied number of events that are arranged throughout the year, for us all to enjoy and take part in, so please support the efforts of the staff and club as often as you can. CHURCH SERVICES: Church services for the parish of Ewhurst, will commence at St. James the Great, Ewhurst Green on Sunday April 14th. Palm Sunday.at 9.30am. This service will include Holy Communion. (BCP) A Palm Sunday Praise service at St. Mark’s church, Northiam Road, Staplecross will follow directly after at 11.15 am. This service will also include Holy Communion. There will be NO SERVICE today at St. Giles church, Bodiam. ADDITIONAL SERVICES FOR HOLY WEEK: On Wednesday April 17th there will be ‘Holy Week Mid-Day prayers’. These will be held at St. Mark’s church, Northiam Road, Staplecross at 12 Noon. The following day - Thursday April 18th. - Maundy Thursday - There will be a Maundy Thursday Eucharist of the Last Supper at St. James church, Ewhurst Green at 7.30pm. On Good Friday -Friday April 19th - there will be held ‘Good Friday Meditations’ and will include Preaching and Prayers of the Cross at 9.30am at St. James the Great, Ewhurst Green and following on at 11.15am at St. Giles church, Bodiam There will be NO SERVICE at St. Mark’s church Staplecross on this day.On Easter Day Sunday 21st April at 9.30am there will be a Parish Easter Communion service at St. James the Great, Ewhurst which will also include Holy Communion (CW) This will be followed by that much loved ‘Easter Egg Hunt’ which will take place in the churchyard. A Parish Easter Communion service - again followed by an Easter Egg Hunt in the churchyard will also follow directly afterwards at 11.15am at the church of St. Giles, Bodiam. Again there will be NO SERVICE at St. Mark’s church, Staplecross on this day. In case you may be unaware, on Wednesday and Thursday morning - ‘MORNING PRAYER’ is now being held in St. James the Great, Ewhurst Green every week on these days at 8.30 am. ‘EVENING PRAYER’ is also being held every Thursday evening at 6.00pm. in St. Giles church, Bodiam. Do join us if you wish. - everyone is most welcome. If there is any church matter on which you feel you may need further assistance - especially Baptisms - Weddings - and sadly - Funerals, then do please get in touch with our Priest-in-Charge - Cannon Christopher Irvine on 01580~830925. Help in some way is always at hand and so generously given so please do contact him.